NI Vans are an independent Mini Breaker in Northern Ireland. 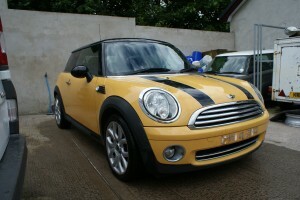 We supply new and used mini parts, we are located in Tandragee, Co. Armagh, if you wish to call and collect your parts. All Mini parts are mostly shelved enabling us to offer a couriered delivery service throughout the UK and Republic of Ireland. We have a selection of used Mini parts covering Mini models R50, R52, R53, R55, R56, R57 in all trims, including Mini One, Mini Cooper, and Mini Cooper S. We also offer Mini tuning parts such as reduction pullies, spark plugs, gates aux belts and JCW tuning parts. Fitting Service Available. If you are lucky enough to live in the beautiful country of Northern Ireland we can also offer a Mini Parts fitting service allowing you to keep your mini on the road stress free of maintenance worries.